In our final post in this series we celebrate the success of the African Nova Scotian Health Sciences Summer Camp and highlight the impact of this opportunity. It is important to recognize the role of mentors and those who have gone through or are going through the programs. A key piece to the week was meeting with mentors who shared their stories and provided motivation and encouragement to the students. The students spent time with Andrew Owusu – occupational therapy student, Cindy Ochieng and Imhokhai Ogah – undergraduate medical students, Josephine Muxlow – nurse and adjunct faculty member, and Crystal Watson – Masters of Arts in Leisure Studies graduate and therapeutic recreation instructor. I [am] surrounded by people that [are] like me and it’s empowering. 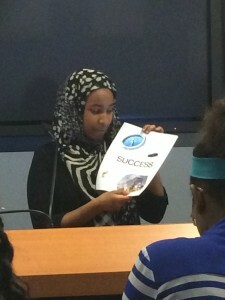 To end the week students learned more about opportunities available to them such as tutoring in STEM (science, technology, engineering, and math) from Imhotep’s Legacy Academy and later when they enter university with the student summer research programs in medicine, health professions, science and engineering. 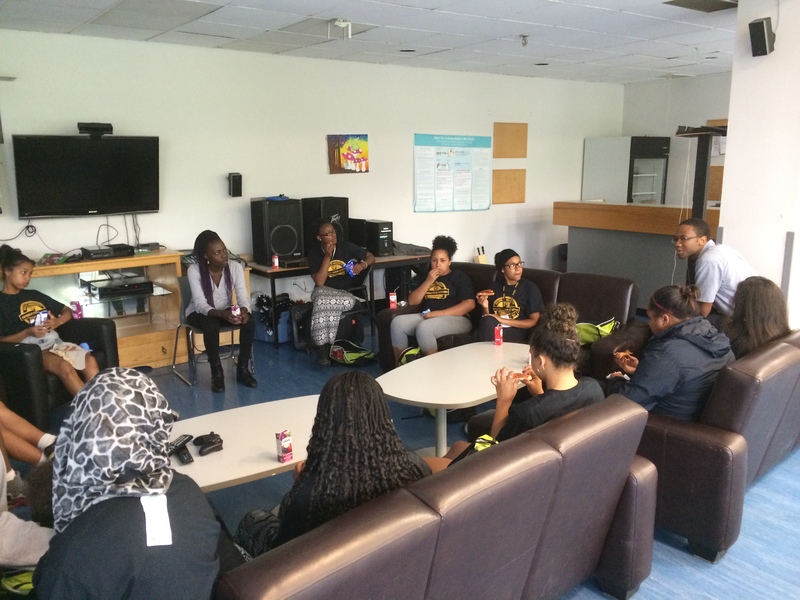 Students also learned about the services offered at Dalhousie such as the Black Student Advising Centre and Studying for Success. 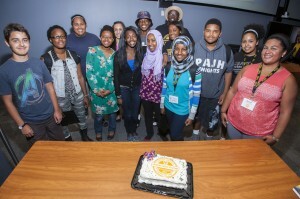 At the closing ceremony, attended by the Honourable Minister Tony Ince of African Nova Scotian Affairs and Communities, Culture, and Heritage, students were able to share their successes and enjoy a slideshow of pictures from the week with their families and those present from the university. Pictures from the camp can be found on our Facebook page – PLANS. A special thank you to the School of Nursing for sharing their vision and supporting the camp. A heartfelt thank you to those who planned and facilitated the activities around campus, to the camp counsellors, and to the families of the participants for supporting their students in achieving their goals! 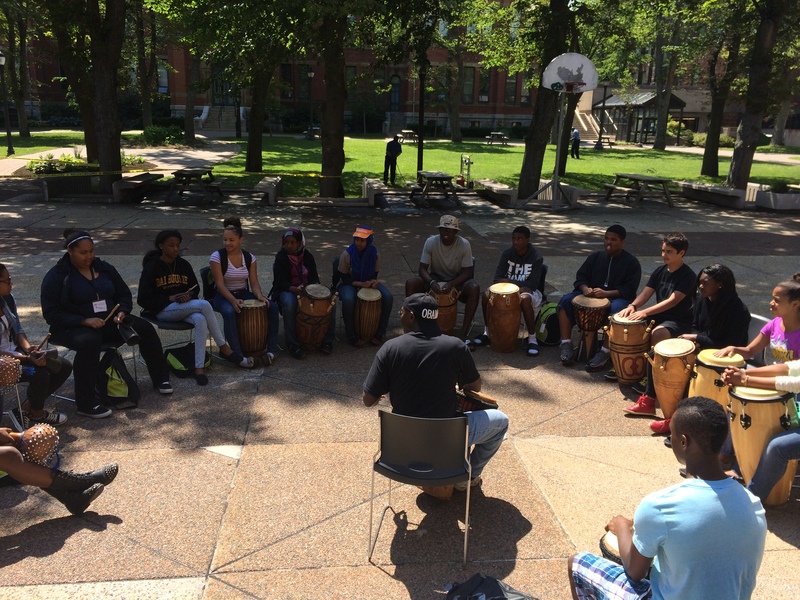 Next year we plan to expand and invite students from across the province to have this experience! Stay tuned! The Faculty of Medicine’s Learning Resources Centre is where the students learned a little bit more about the training required to become a doctor. Students learned how to take each other’s blood pressure, oxygen levels, and perform CPR. 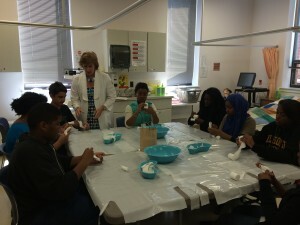 Students were also exposed to the Simulated Patient program – where individuals are hired to act as patients for training purposes. At the Faculty of Dentistry, students learned more about the variety of programs and careers available to those interested in studying oral health. 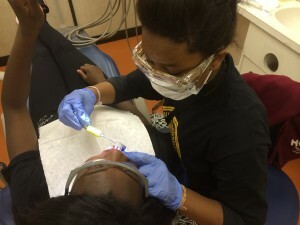 Students were paired up, used the dentist chair and looked into each other’s mouths with a small mirror. After chewing a disclosing tablet, students were able to see where plaque had built up on their teeth and then how to properly brush to prevent cavities. The coolest part of the experience was preparing and filling a model tooth using the dental drill and other dental tools. Visits to the Faculty of Health Professions were spread out through the week. Students visited School of Occupational Therapy learning about a variety of adaptive methods to improve lives and the School of Physiotherapy learning how to measure strength and manipulate muscle groups through the use of electrodes. 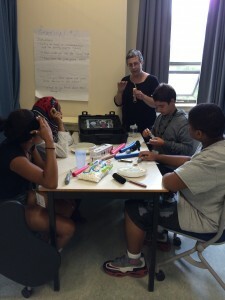 Students visited the School of Health and Human Performance where they counted their steps, took part in team building exercises and learned more about kinesiology and the movement of the body, health promotion and promoting healthy behaviours, and therapeutic recreation, and recreation management. Their favorite part was making the stress balls! 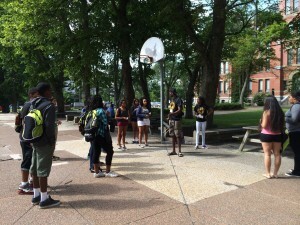 On two occasions the students visited the School of Nursing. 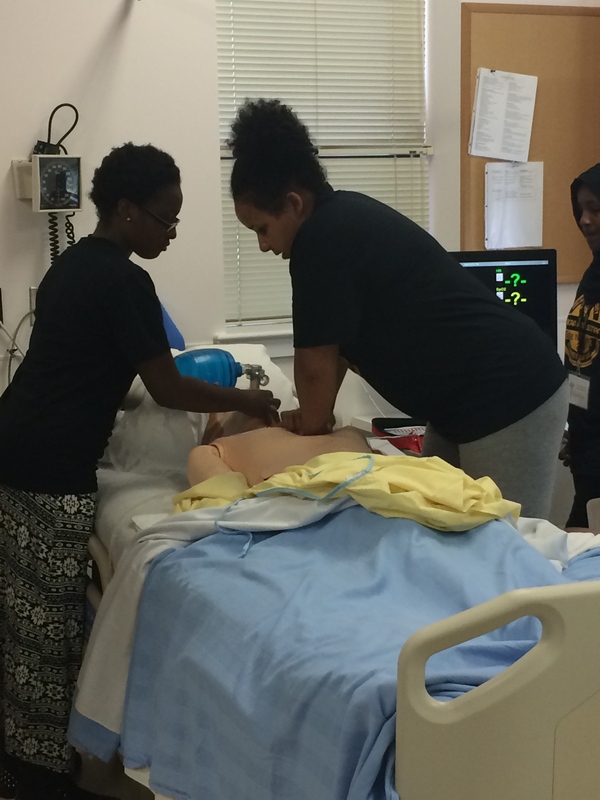 Having previously hosted summer camps for African Nova Scotian youth, Nursing was ready and waiting to meet the students. Students had the chance to listen to lung and heart sounds on medium and high fidelity patient simulators, they learned how to weigh babies, to properly protect themselves, remove staples and stitches, make a finger cast, and even administer injections! Students also had the opportunity to perform CPR in a mock situation with a high fidelity simulator who had lost consciousness and a pulse could not be found! Students did a great job and revived the patient every time! Click here to continue to part 3 of this series. 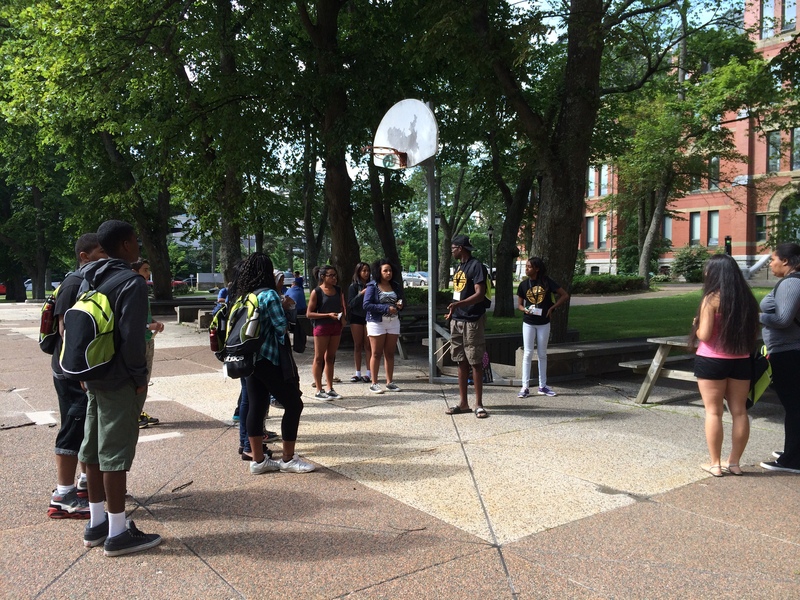 On July 7th, 15 junior high and high school students descended onto the Dalhousie University campus for a fun week of educational experiences. 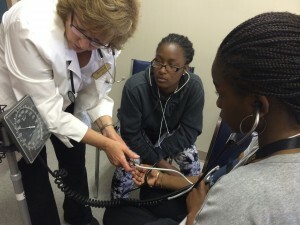 These students were here to attend the inaugural African Nova Scotian Health Sciences Summer Day Camp – a camp aimed at introducing students to the health professions through hands-on and fun activities, hopefully to peak interest in pursuing a career in health, and learn about the supports that exist to help them achieve their goals. 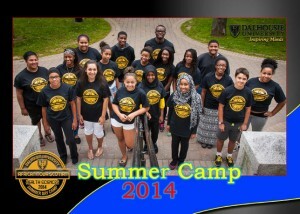 The purpose of the camp is to increase interest in the health professions within the African Nova Scotian community. Building on the success of the School of Nursing Summer Camp for African Nova Scotian youth, PLANS (or Promoting Leadership in health for African Nova Scotians) organized this year’s camp to encompass the Faculties of Medicine and Dentistry as well as schools in the Faculty of Health Professions. The camp also offered personal development, cultural and recreational activities such as African drumming, swimming and teambuilding exercises. The first day ended in an opening ceremony attended by member of the African Nova Scotian Health Sciences Advisory Committee, Dr. Carolyn Watters (Vice President and Provost), Dr. Constance Leblanc (Acting Dean of Medicine), Dr. Tom Boran (Dean of Dentistry), other faculty members, and student families. The remainder of the camp was filled with visits to the Faculty of Medicine, Dentistry and Health Professions including the School of Health and Human Performance, School of Occupational Therapy, School of Physiotherapy, School of Nursing, and the Faculty of Science Biology department. In Part 2 of this series we will explore these sessions in more detail.